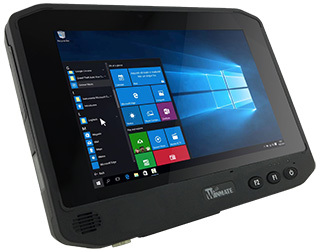 Winmate M800BW – Compact, Rugged, Lightweight 8-inch Windows Tablet PC. Winmate M800BW – Compact, Rugged, Light weight 8-inch Windows Tablet PC. The M800BW is small and handy, it is quite rugged and very well sealed, it's only an inch thick and weighs about 2.4 pounds.It runs Windows 10 IoT Enterprise or Windows Embedded 8.1 Industry Pro on a reasonably quick quad-core 1.60GHz Intel "Braswell" Pentium N3710 that can reach burst speeds of up to 2.56GHz. It can also accommodate up to 8GB of RAM and up to half a terabyte of speedy solid state disk. For those needing it, an active pen is available and a battery charge lasts up to 7.5 hours. There are the usual two cameras, one in the front and one in the back. The M800BW also has an optional fingerprint scanner for access security and an optional Smart Card reader. All of this means the M800W can be used just like a regular tablet in any enterprise or business setting. But mobile tablets, especially small and compact ones, usually don't have much on board connectivity. Well, the Winmate M800BW is an exception. It comes with two full-size USB 3.0 ports, and there's also a mini-HDMI port. Where does use in vehicles come in? This is where it gets interesting. 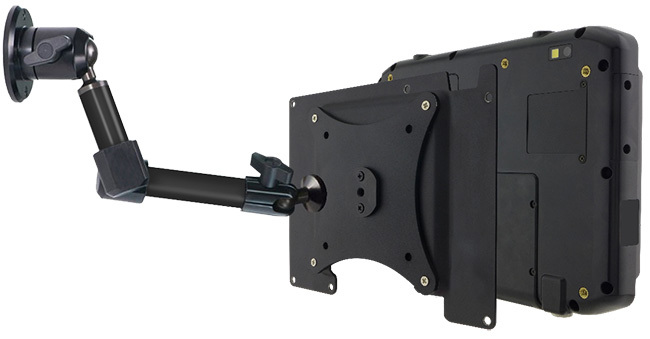 That's because the M800BW can also be ordered in a version that includes a special M12 industrial connector that links the tablet to the optional CPM 800 expansion box. The box is shown in the image below.